Learn to do Russian Snake Stitch (similar to our daisy chain stitch) and Russian Cross Stitch edging by completing these five different bracelets. Wear one, two or all five for a stunning display. 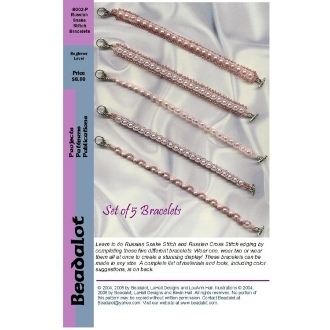 These bracelets can be made in any size and use 4mm crystal or glass pearls, 11/0 seed beads and 15/0 seed beads. You'll also need #12 beading needles, nylon thread and toggle clasps.